I had been itching to do a portrait lately and I knew I wanted it to be someone glamorous, but I also knew I didn't feel like doing one of my typical fashion blogger illustrations. Or even one of my street style stalking targets. Not that I don't enjoy those subjects any more. But my art's been feeling so... well... literal. I kind of feel like I got out of my comfort zone recently with the slightly fetishy illustrations I did for the show at ArtFront Galleries. So today I also wanted to try something new. Without overthinking it (for once—this'll probably never happen again!) 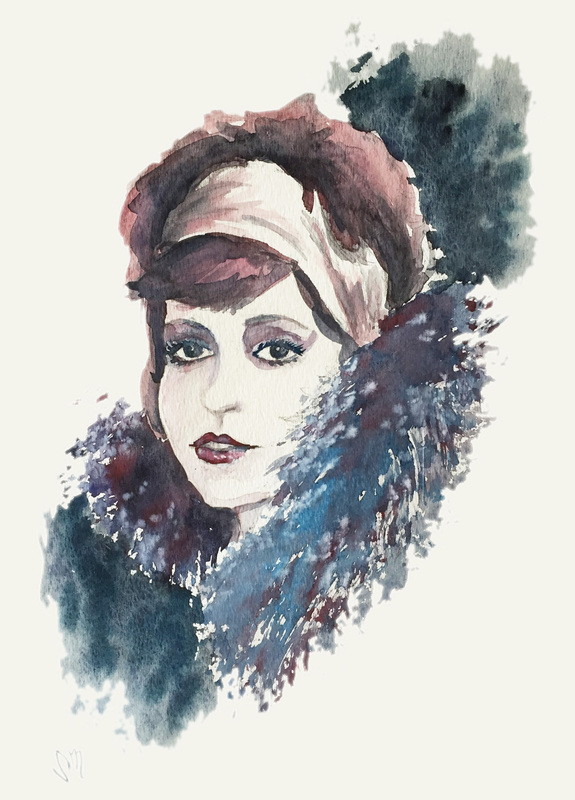 I decided to make Clara Bow's face come to life in watercolor. Then as I was doing it, I promised myself I wouldn't worry about the details of silent film legend's features and just let the medium give the subject a soft, dreamy effect. I have to say, it was a lot of fun, letting go of my usual slavish devotion to detail. So now, the only question is, what or who do I illustrate next?